In the previous chapter, you have seen how to create empty slides and how to add slides to it. In this chapter, you will learn how to get the list of available slides, and how to create a slide with different layouts. 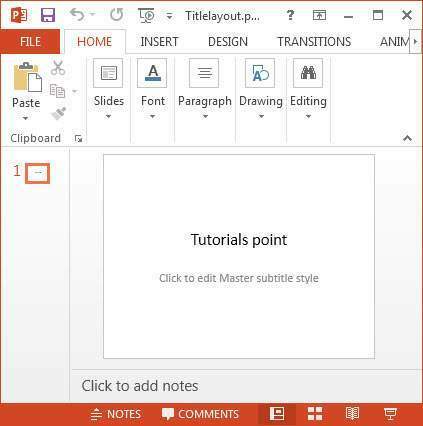 PowerPoint presentations have slide layouts, and you can choose a desired layout to edit a slide. First of all, let us find out the list of all the slide layouts available. There are different slide masters and in each slide master, there are several slide layouts. You can get the list of the slide masters using the getSlideMasters()method of the XMLSlideShow class. You can get the list of the slide layouts from each slide master using the getSlideLayouts() method of the XSLFSlideMaster class. You can get the name of the slide layout from the layout object using the getType() method of the XSLFSlideLayout class. Note − All these classes belongs to org.poi.xslf.usermodel package. 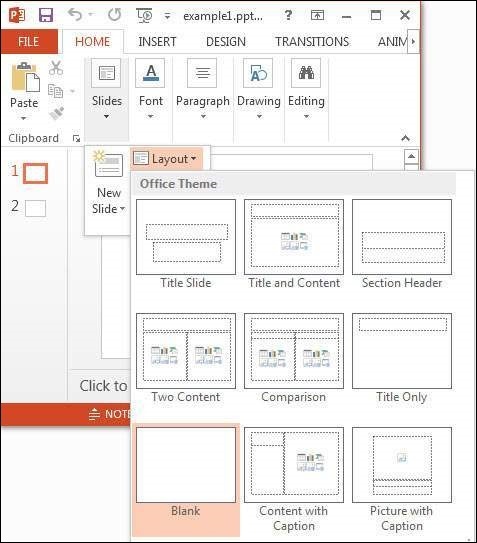 Shown below are some of the sample slide layouts available with MS-Office 360, 2013 edition. Step 1 − Create an empty presentation by instantiating the XMLSlideShowclass as shown below. Step 2 − Get the list of slide masters using the getSlideMasters() method. Thereafter, select the desired slide master using the index as shown below. Here we are getting the default slide master which is in the 0th location of the slide masters array. Step 3 − Get the desired layout using the getLayout() method of the XSLFSlideMaster class. This method accepts a parameter where you have to pass one of the static variable of the SlideLayoutclass, which represents our desired layout. There are several variables in this class where each variable represents a slide layout. Step 4 − Create a new slide by passing a slide layout object as parameter. Step 5 − Select a placeholder using the getPlaceholder() method of the XSLFSlide class. This method accepts an integer parameter. By passing 0 to it, you will get the XSLFTextShape object, using which you can access the title text area of the slide. Set the title using the setText() method as shown below. 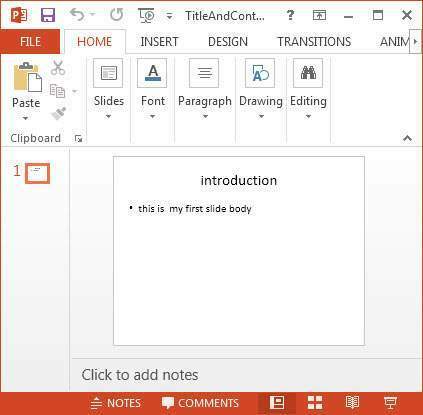 Let us create a slide in a PPT using Title and content layout. Follow the steps given below. Step 2 − Get the list of slide masters using the getSlideMasters() method. Select the desired slide master using the index as shown below. Step 3 − Get the desired layout using the getLayout() method of the XSLFSlideMaster class. This method accepts a parameter where you have to pass one of the static variable of the SlideLayout class which represents our desired layout. There are several variables in this class that represent slide layouts. Step 4 − Create a new slide by passing the slide layout object as parameter. Step 5 − Select a placeholder using the getPlaceholder() method of the XSLFSlide class. This method accepts an integer parameter. By passing 1 to it, you will get the XSLFTextShape object, using which you can access the content area of the slide. Set the title using the setText() method as shown below. Step 6 − Clear the existing text in the slide using the clearText() method of the XSLFTextShape class. Step 7 − Add new paragraph using the addNewTextParagraph() method. Now add a new text run to the paragraph using the addNewTextRun()method. Now to the text run, add text using the setText() method as shown below. In the same way, you can create slides with different layouts as well.